The men’s lacrosse team lost 17-5 to Babson College on Saturday in a conference matchup. The loss dropped the Lions from sixth to seventh place in the New England Women’s and Men’s Athletic Conference. The Lions opened the first quarter with a goal attempt from freshman midfielder Skyler Celotto, who received the ball in the crowded face-off circle and rocketed it towards the net. But Babson junior goalie Christopher Aranalde blocked the shot. One minute later, Emerson sophomore midfielder Tim Doyle caught a pass near the net and scored the first goal of the game, which gave the Lions a 1-0 lead. With ten minutes remaining in the first quarter, Babson senior attacker Samuel Mishkind scored the first of his three goals for the Beavers to close out the first half with a lead of 3-1. In the second quarter, Babson increased its lead to 5-1. Babson sophomore midfielder Alex Lesher turned the ball over to Celotto, who ran it to the goal and launched a shot from a long distance and scored. This dropped the Beavers’ lead to 5-2. Babson then scored three consecutive goals. On the third goal, Emerson freshman goalie Malcolm McGrath earned a one-minute penalty for slashing at the Babson attacker. Senior goalie Bailey Kennedy substituted in for McGrath while he was on the sideline. The second half ended in an 8-2 Babson lead. Head coach Matt Colombini said he did not worry when McGrath earned the penalty because he can rely on Kennedy as a player. The Beavers opened up the third quarter with two goals, but the Lions answered back with a goal by junior attacker Austin Franklin, who was assisted by Celotto. 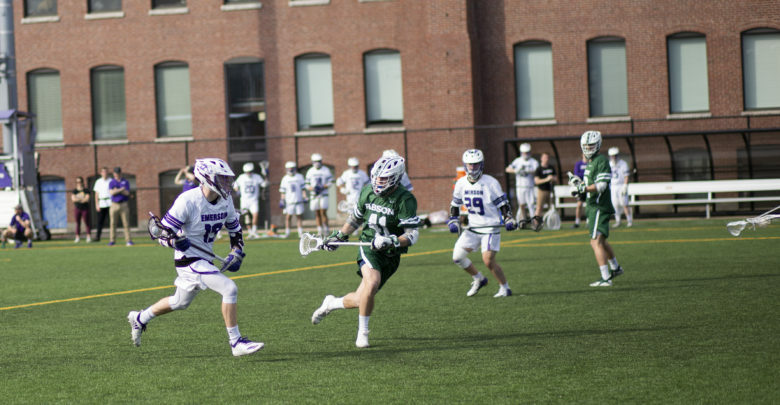 With five minutes remaining in the third quarter, Babson sophomore midfielder Ethan Carpenter received a one-minute penalty for slashing at an Emerson player. During the one-minute penalty on Babson, the Lions had a one-player advantage and Celotto scored a goal, assisted by Franklin, to bring the score to 10-4. The Beavers scored two goals to close out the third quarter 12-4. 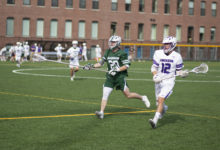 In the fourth quarter, Babson scored four consecutive goals, but McGrath saved the fifth from going in with his left foot. The Beavers scored another goal with three minutes remaining and Celotto scored one final goal to close out the game with three goals, one assist, and six ground balls. Colombini said the Lions competed as best as they could against Babson, tied for first in the NEWMAC, and said Celotto played a vital role on both ends of the field. The Lions will play their next game at the Massachusetts Institute of Technology on Wednesday, April 17 at 7 p.m. and will host Wheaton College on Saturday at 5 p.m. for the team’s senior day. Kennedy said that the senior day game will be an emotional moment for him and his teammates.